In pressing times, we often wish we didn’t have to wander the streets, getting things off our shopping checklist. More so when you’re shopping for a wedding (your own or someone else’s). To tackle that, we found Sajni, The Designer Shop, a store located in Santacruz West, that is your one-stop shop for every single wedding accessory, starting from the studded hair clip, to extensive jewellery sets. Dazzling wedding footwear, check. Fancy designer clutches, check. Wedding imitation jewellery, check. Hairpins, bangles, anklets, kaleeras, all check. That’s what we’re saying. Sajni, all under one big roof, houses everything that is even remotely related to a wedding, except the outfits. Once you enter, give your eyes a little break to adjust to all the bling inside. 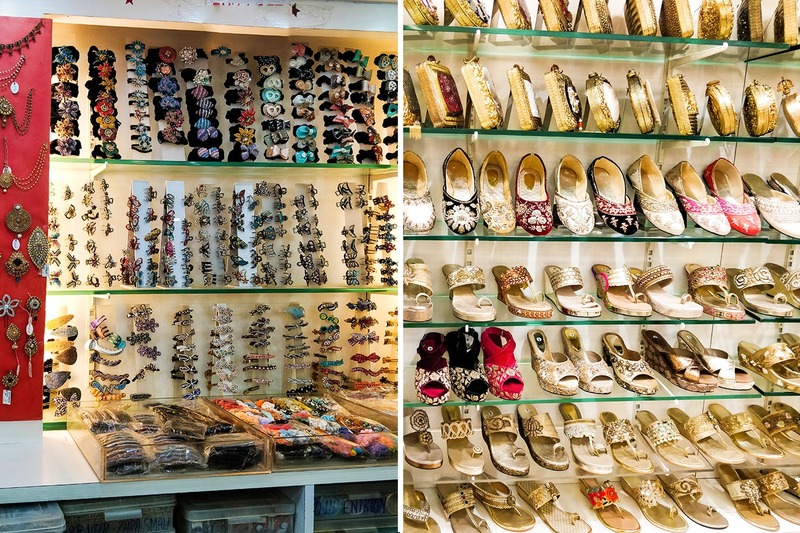 And then move ahead to face this rack that is lined up with wedding footwear – sandals that start at INR 1,800, and juttis that are priced INR 2,500 onwards. Then they have choodas starting at INR 3,000 and to go with that the kaleeras – the basic ones will cost you INR 350- INR 400 a pair, and the fancy ones that with come with embellishments start at INR 1,500. Take a step back and you will find an extensive range of hand clutches to match with your outfit starting at INR 8,000. While here, take a quick look around and you will also find larger-than-life hair pins, hair clips, and other hair accessories. To top all of this, they a variety of jewellery pieces to pick from. Made out of copper, these imitation jewellery pieces have been given a gold-set look and are affordable starting at INR 8,500. However, if you like any of their jewellery sets, you will have to buy them as they don’t rent it out. End your search for wedding accessories at Sajni boutique, a singular shop that’s will cater to all your wedding needs under one roof. Don't miss out on the gorgeous mother of pearl inlay clutches that are on display. We've already set our hearts on some designs!